Clive's new show, "ROSE'S FRONT STALLS BAR", tells his story from his first job working front of house at the Adelphi Theatre, London to his rise in fame and leading theatre roles. It is dedicated to a cockney theatre barmaid called Rose, who loved to hear Clive sing. Since his first role whilst at drama school when he won the part of Dink in the Sheffield Crucible production of Carmen Jones, Rowe has gone on to feature in acclaimed productions of Company, Carousel, Lady Be Good, Candide, Chicago and many others. He is best known for his role as Nicely Nicely Johnson in the National's revival of Guys and Dolls, for which he won the 1997 Olivier for Best Supporting Performance in a Musical. His turn in the number, "Sit Down You're Rockin' the Boat", achieved legendary status for its rapturously show-stopping encores. Clive is a straight theatre veteran, too. He has appeared in plays such as Money, Measure for Measure, Twelfth Night, The Mystery Plays, School for Scandal, Trackers and The Lady Killers. 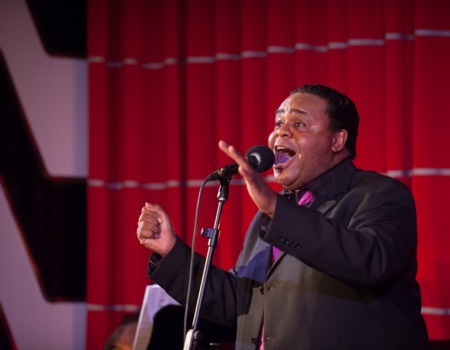 Although, music is his first love, Clive has gained many fans and has become a Hackney institution during his 8 years at the Hackney Empire in panto. He recently finished Kiss Me Kate at the Chichester Festival theatre and after his week at Crazy Coqs he will be resuming the same show at the Old Vic in London.